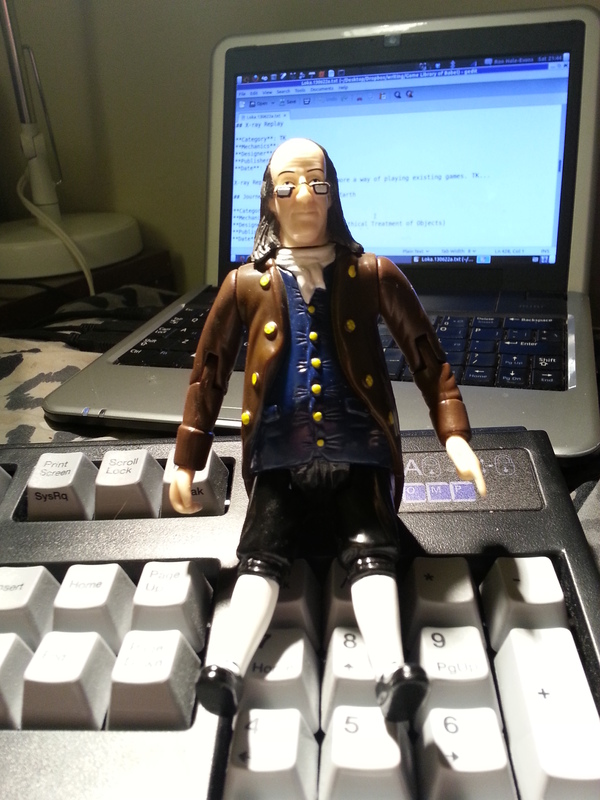 As an early birthday present, my wife Marty got me a Benjamin Franklin action figure, which I have been using for rubber duck debugging my writing. Turns out ol’ Ben is a good listener. Has a lot of good advice too. “Wise sayings,” he calls ’em. Just complaining and explaining to Ben that I don’t have a complete top-down structure for my book yet focused my wobbly gray matter to the point that I was able to generate two pages of notes on the topic. I prefer Ben Franklin to a rubber duck for such exercises. My reasons are manifold. I have fond childhood memories of the episodes of Bewitched where they brought Ben into the Twentieth Century. In fact, during his life he said he wanted to be kept in a cask and awoken every hundred years or so after his death to be shown all the new stuff that had happened. Thus, I feel that as a magical time traveling proto-transhumanist, he would appreciate some of the games I’m writing about. I need to find the time to create a page for this hack on the Mentat Wiki. Or you go ahead.